How Perilous is Man's Existence? tolerable weather, a constant climate, and stable sea level? Note: These papers or journals have received cursory reviews but have not obtained standard academic peer review. News in 2019: The author has self-published two books in both eBook and printed format. They are The Great Deluge: Fact or Fiction? (eBook format and printed format) and The Great Deluge: Fact or Fiction? Companion Book (eBook format). Shortly pending is a third book, Mankind's Chaotic and Mysterious Past. 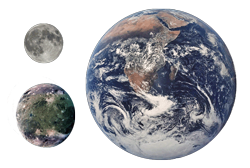 These journals and hypotheses will trace from the birth of the Earth-Moon system backward through the formation of the solar (any star) system, the creation of the varied celestial bodies, and galaxy evolution to the Big Bang. Our existence not only depends on materials produced inside stars, but also the processes for the aggregation of these materials into objects supporting liquids and solid surfaces for living organisms to make a home. A congruent storyline is provided that connects all the dots and explains why we precariously exist. The newest journals released in 2017 continue the thinking of mankind's precarious existence. These new papers, "The Great Deluge: Fact or Fiction?" and "A Brief History of Mankind's Chaotic Past," explore the evidence that indicates cyclic catastrophism occurring not only on Earth but on the other celestial bodies of the solar system. The Sun's orbiting sister dwarf star, Nemesis, and its effect on Earth are explained. The most recent major catastrophe caused by the returning Nemesis is the Great Deluge and its attending Holocene Extinction Event of 11,500 years BP. Very detailed and numerous forensics, and man's worldwide verbal and written record are presented as proof. Budding scientists looking for a thesis topic, computer programmers looking for a likely model to simulate, NASA scientists searching for the next project for their space telescopes and probes, and professors needing a new study for funding please consider these newly presented hypotheses. The author will be overjoyed to gather a team of collaborators. Please contact the author for discussions and suggestions for model simulations or laboratory experiments. The basic ideas presented in these journals are copyrighted, but need not constrain interested parties from making improvements, corrections, and expanding proofs and supporting evidence. Copyright © 2011- Douglas B. Ettinger. All rights reserved.